Atrial flutter is a cardiac arrhythmia that typically causes tachycardia (a fast heart rate) and palpitations, and that can increase a person’s risk of a stroke. It is related in many ways to the more well-known arrhythmia, atrial fibrillation. Atrial flutter is caused by the formation of extremely rapid, abnormal electrical impulses arising in the atria. Typically, about half of these impulses are transmitted to the ventricles, producing a heart rate that is usually around 150 beats per minute. Because this arrhythmia originates in the atria, it is considered a form of supraventricular tachycardia. Read about the heart’s chambers and valves. Atrial flutter is a type of reentrant arrhythmia; it occurs when an electrical impulse becomes “trapped” in a circuit within the heart, and begins spinning around and around that circuit. With atrial flutter, the reentrant circuit is a relatively large one that is usually located within the right atrium, and which usually follows a characteristic path. Because the circuit responsible for atrial flutter is usually well-defined, this makes atrial flutter particularly suitable for ablation therapy. By creating a blockage in a particular location within that characteristic path, the reentrant circuit can be disrupted, and the atrial flutter can no longer occur. The rapid heart rate commonly produce by atrial flutter most often leads to pronounced palpitations, dizziness, fatigue, and dyspnea (breathlessness). Like most reentrant arrhythmias, episodes of atrial flutter tend to come and go quite suddenly and unexpectedly. If a person with atrial flutter also has coronary artery disease, the rapid heart rate can place enough stress on the cardiac muscle to cause angina. Atrial flutter can also produce a sudden worsening of symptoms in people who have heart failure. Because the symptoms it produces can be intolerable, atrial flutter would be a significant arrhythmia even if all it did was cause uncomfortable symptoms. But the biggest problem with atrial flutter is that, as is the case with atrial fibrillation, this arrhythmia tends to cause thrombus formation (blood clots) in the atria. These blood clots can break loose (embolize) and cause strokes. So people with atrial flutter, like those with atrial fibrillation, have a significantly increased risk of stroke. Furthermore, atrial flutter often tends to be a “bridge arrhythmia” to atrial fibrillation. That is, people with atrial flutter will often go on to develop chronic atrial fibrillation. While anyone can develop atrial flutter, it is not a common arrhythmia. It is much less frequent, for instance, than atrial fibrillation. The people most likely to develop atrial flutter are the same ones also most likely to develop atrial fibrillation. These include people who are obese, or who have lung disease (including pulmonary embolus), sleep apnea, sick sinus syndrome, pericarditis, or hyperthyroidism. Atrial flutter is also seen in people who have had previous heart surgery. Diagnosing atrial flutter is fairly straightforward. It merely requires capturing the arrhythmia on an ECG, and looking for what are called “flutter waves.” Flutter waves are signals appearing on the ECG that represent the electrical impulse that is spinning around and around the atrial reentrant circuit. With one major exception, the treatment of atrial flutter is similar to that of atrial fibrillation. That one exception is that, in comparison to atrial fibrillation, using ablation therapy to eliminate atrial flutter is relatively easy to accomplish. 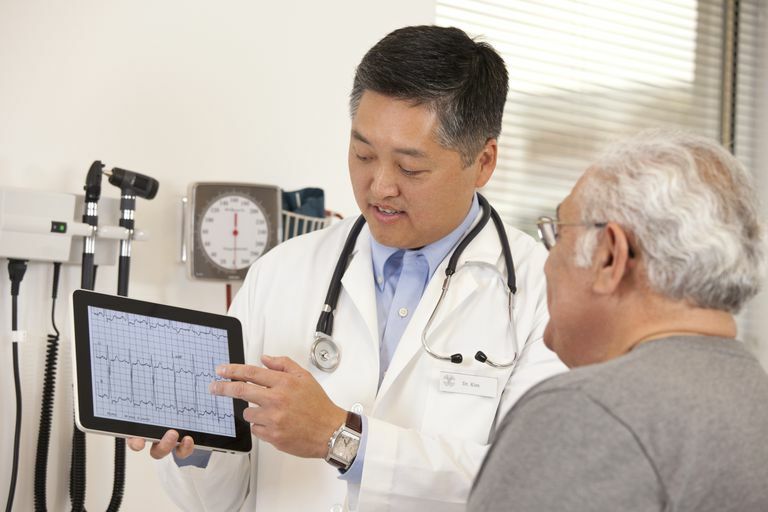 Read about treating atrial fibrillation. In people who are having an acute episode, atrial flutter can be stopped quite readily with electrical cardioversion, or by acutely administering antiarrhythmic drugs (usually, ibutilide or dofetilide). If symptoms are severe during an acute episode, slowing the heart rate may be necessary while making preparations for cardioversion. This can often be accomplished quickly by administering intravenous doses of the calcium blockers diltiazem or verapamil, or the rapidly-acting intravenous beta blocker esmolol. These drugs must be used cautiously, however, in people who also have heart failure. Once an acute episode has been dealt with, the next step is to attempt to suppress further episodes of atrial flutter. In this regard it is important to look for, and treat, any reversible underlying cause, such as hyperthyroidism, sleep apnea, or obesity. Hyperthyroidism can usually be sufficiently controlled within a few days, and sleep apnea is also generally treatable within in a reasonable period of time. While obesity is also a reversible cause of atrial flutter, in practical terms it is often not reversed sufficiently or quickly enough to assist substantially in treating this arrhythmia — so other means of controlling it must be used. If no readily reversible cause is found, treatment aimed directly at preventing atrial flutter is necessary. This treatment will consist either of suppressing the arrhythmia with drugs, or using ablation therapy. Antiarrhythmic drugs have a poor success rate with atrial flutter — only 20% to 30% of people treated with drugs are successfully controlled after a year of therapy. For this reason, and because of the many toxicities common with antiarrhythmic drug therapy, ablation therapy is by far the treatment of choice for most people who have atrial flutter. Fortunately, ablating atrial flutter is usually a relatively straightforward procedure, with a very favorable rate of success — well over 90%. In the large majority of people who have this arrhythmia, ablation ought to be strongly considered. Since ablation works so well, resorting to a “rate-control strategy” (commonly used for atrial fibrillation) is only rarely necessary for atrial flutter. A rate control strategy means allowing the arrhythmia to occur, and attempting to control the resulting heart rate in order to minimize symptoms. Controlling the heart rate in atrial flutter is substantially more difficult than it is with atrial fibrillation, and commonly requires the use of a combination of beta blockers and calcium blockers. On occasion, to get the heart rate under control it is necessary to ablate the heart’s normal conducting system to create heart block, then insert a pacemaker to establish a stable heart rate. Obviously, getting rid of the atrial flutter altogether with an ablation procedure is usually the far more preferable course of action. In cases where a rate-control strategy is used, however, chronic anticoagulation therapy is recommended to prevent stroke, just as it is with atrial fibrillation. Atrial flutter is a relatively uncommon cardiac arrhythmia that is related to atrial fibrillation. Like atrial fibrillation, atrial flutter produces uncomfortable symptoms, and increases a person’s risk of stroke. However, in contrast to atrial fibrillation, ablation therapy for atrial flutter is usually quite straightforward, and generally can be accomplished with a high rate of success.